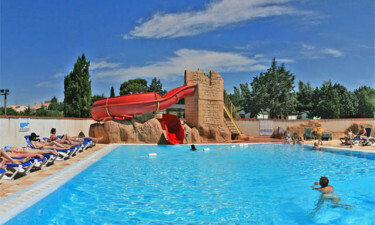 Le Roussillon campsite is the perfect setting for a tranquil, relaxing family holiday. With an on-site pool, mobile home accommodations, and plenty of activities and entertainment, there is something for everyone at this luxury camping site in the lively resort of Saint Cyprien. Located in the Pyrenean seaside resort of Saint Cyprien and next to a lovely park, Le Roussillon LuxCamp is just 5 minute drive away from 6km of sandy beaches. If you prefer not to drive, the frequent land train is free for guests or you can hire cycles. With a pool, water slide, and plenty of sports and entertainments, Le Roussillon is the perfect base for exploring the Mediterranean coastline. Why choose a luxury camping holiday at Le Roussillon? Le Roussillon features an on site heated pool perfect for all-weather bathing. The kids - and grown-ups - will enjoy the thrill of the water slide before relaxing on the sun loungers, while a small paddling pool area allows your water babies to splash about in safety. 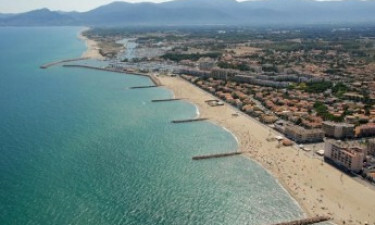 St Cyprien is the ideal location for a family-friendly beach holiday. Beaches of soft golden sand shelve gently to sparkling clear waters of the Mediterranean, ideal for little ones to paddle and build sand castles. 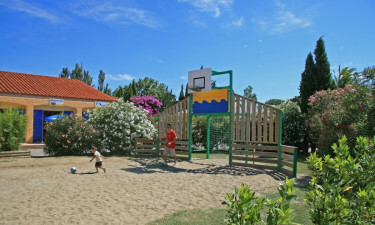 For older kids and adults, St Cyprien offers windsurfing, sailing and water skiing.